With castles, palaces, beautiful scenery, historical sights, and cultural treats, this Munich, Salzburg and Vienna tour—with Oberammergau—is sure to delight all of your senses! 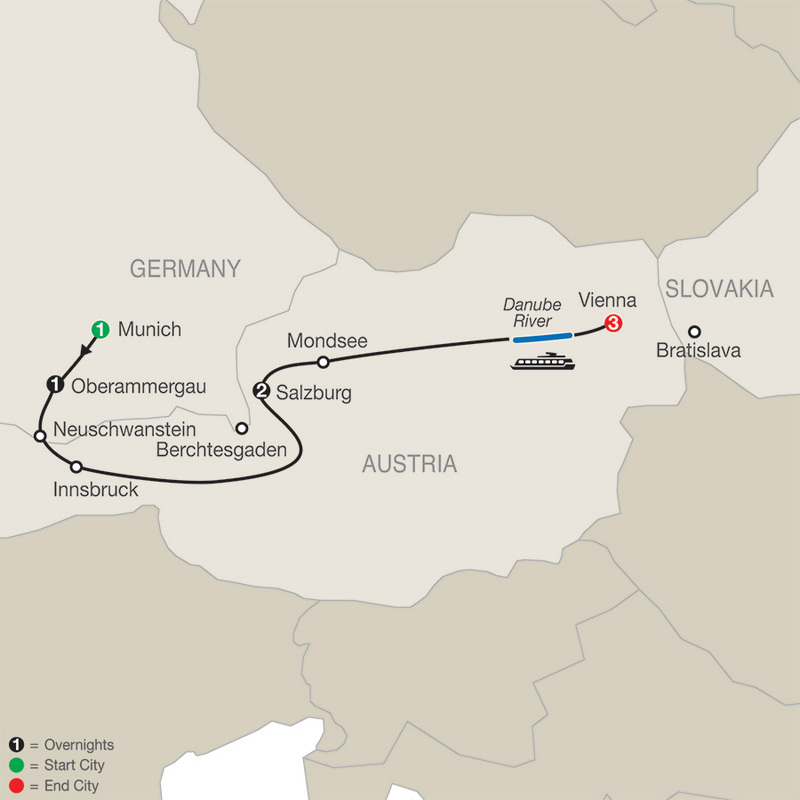 You'll overnight in Munich, Oberammergau, Salzburg, and Vienna, and you'll also spend time in Innsbruck and Mondsee. If you love castles and palaces, you’ll enjoy visiting Neuschwanstein Castle in Germany. Built by King Ludwig II, this fairytale castle offers magnificent views of the Alps and was the inspiration for Walt Disney. Schönbrunn Palace in Vienna offers another treat and glimpse into the life of royalty. Modeled after France's Palace of Versailles, you'll receive a private visit and stand in awe as you witness the splendor and hear the stories highlighting the lifestyle of the Habsburgs, the royal family who ruled Vienna for centuries. Also enjoy a special treat—dinner and a classical music concert here. You’ll also enjoy time in Munich, Germany's "Secret Capital," where you'll visit the lively Marienplatz. Here, observe the famous glockenspiel, which re-creates a 16th-century wedding. In Salzburg, your walking tour includes the magnificent Residenz Square, where some scenes from the Sound of Music movie were filmed, and a visit to Mozart's birthplace, where you’ll see mementos owned by him, such as his childhood violin. But that's not all...on this Munich, Salzburg and Vienna tour, Globus has arranged some out-of-the-ordinary experiences for you. You’ll cruise along the most scenic section of the Danube River, and during the cruise, you’ll savor Kaffee und Kuchen (coffee and cake). In the charming, Bavarian village of Oberammergau, enjoy first-class seats to Oberammergau’s famous Passion Play, held every 10 years. It’s a once-in-a-lifetime experience! All you have to do is grab your camera and get ready for a wonderful vacation! Hitler’s Eagle’s Nest is normally open from mid-May to end-Sept. Check with your Tour Director for the availability of this excursion. Motorcoach; boat cruise. Free wi-fi available on your motorcoach and in most hotel lobbies. Germany’s “Secret Capital” comes alive during an orientation featuring the Olympic Stadium, 1,000-foot-high Olympic Tower, and MARIENPLATZ in the historic heart of the city. A comfortable drive brings you to picturesque Oberammergau. Afternoon and evening are dedicated to the world-famous PASSION PLAY, held every 10 years and performed by the inhabitants of Oberammergau.